My absolute favorite pizza can be found at Pizzeria Bianco in Phoenix, Arizona. Their Rosa pizza - topped with red onion, Parmesan cheese, rosemary and locally-grown pistachios - is to die for. (I know - it sounds crazy, but it is one amazing pizza.) Pizzeria Bianco is so popular that the wait for a table can be up to four hours! Yes, you read correctly - four hours. Our son attended college in Phoenix, so we traveled there from our home in Michigan to visit him in 2011. Having seen Pizzeria Bianco featured on a food and travel t.v. show, I knew I wanted to visit. We had been fore-warned about the wait time and true to the rumors, we waited three and a half hours for a table. Being a total foodie, the wait was worth it to me. (To my kids - not so much.) And, if I ever visit Phoenix again, I will be willing to wait it out once more ... next time, however, I'm sure it'll be alone while the hubby and kids stay back at the hotel. Is there a pizza place you've visited at which you'd be willing to wait that long for a slice? (Everyone I've talked to about my trip to Pizzeria Bianco thinks that I'm nuts to be okay with that long of a wait!) But, here's a cool thing about PB ... they have a bar on their property in another little building so people can grab some drinks and hang out with friends at outside tables while you wait for your inside table . (Music is piped over outdoor speakers and people even play cards while they wait.) So, it can make for a fun evening with friends or family ... it's as much about the experience of the wait as it is the pizza. When I make pizza at home, I like to do so on the outdoor grill. But, during the colder months, I follow the method used in this recipe. I buy pizza dough in the frozen section of my grocery store (some pizza joints will sell ya some dough) and I pan-"fry" the dough in a little olive oil on a cast iron skillet or griddle pan. Once the first side is bubbly and fried, I flip it over and add the toppings. Then, into the oven it goes to finish. The result is a blistery, crisp exterior while the interior of the dough is chewy and pillowy. And, it's pretty quick to throw together from start to finish. I thaw my dough overnight in the fridge and allow it to rest on the counter for about an hour before using. Just a few minutes on the stove top and a few minutes in the oven is all it takes after that! I used a combination of basil pesto, baby spinach, tomatoes and mozzarella cheese today. You can use any type of sauce or topping(s) you prefer. Our favorite is simply tomato sauce, fresh mozzarella and torn basil. Cut pizza dough equally in half. Lightly flour a clean work surface. Using you hands, press out dough and form into a circle or oval (roughly 6 - 8 inches wide). It doesn't have to be perfect. Heat a good drizzle of olive oil (roughly 2 tablespoons) in an oven-safe skillet (cast iron works best) over medium-high heat. 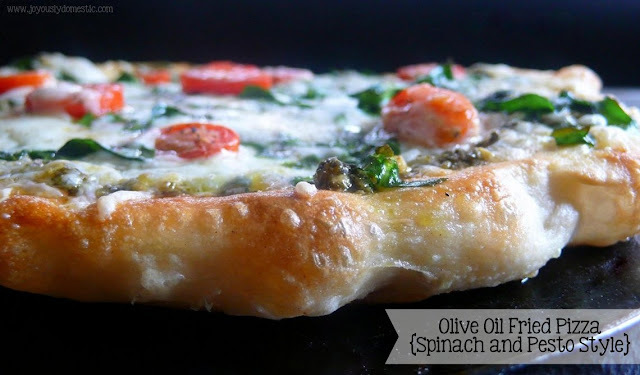 Spread pesto across dough (or whatever sauce you're using). Sprinkle on half of the mozzarella cheese you plan to use for one pizza - about 1 ounce. Sprinkle on an even layer of chopped spinach. Sprinkle on the remaining 1 ounce of mozzarella cheese. Lay out 6 - 8 tomato halves. Sprinkle on a tablespoon (a good-sized pinch) of shaved Parmesan. Drizzle on a little olive oil and top with a healthy dose of freshly-cracked black pepper. Finish in the oven until everything is nice and bubbly - about 5 - 7 minutes. Repeat directions to make second pizza. NOTE: Here's a naughty little secret ... I usually use two packages of frozen pizza dough, which is enough for four pizzas. But, my family only needs three pizzas. What do we do with the extra dough? We fry it up in the pan on each side, then sprinkle on a cinnamon/sugar mixture. It tastes like that fabulous "fair food" fried dough treat that we all love! Wow, this looks really interesting. I'm a pretty avid pizza griller, but had never thought to try this method in the winter months. Thanks! You could make this on a grill and get the best of both worlds. I bet it would be AMAZING! !